That passenger window you can’t roll down because it will never come back up. The confounding squeaks and thumps that emanate from under the hood when you turn the key. The meaningless check-engine light that won’t ever go dark again. The struggles of owning a beater car are endless, but you’ve come to appreciate the charm of your little lemon. Then you see how much money your friends earn driving for ride-sharing services. Your ancient beauty may run just fine, but she’s not going to make the cut for passengers. 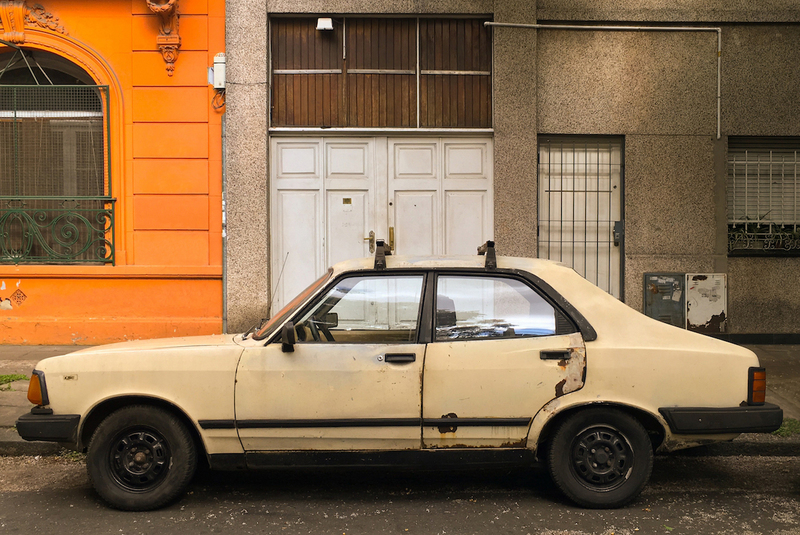 We found some ways you can earn money from your car — even if the bumper doesn’t match, and you can’t open the passenger-side door when it rains. Feel like you’re in your car all day long? The commute to and from work, running errands, shuttling kids — those miles add up. But you can get paid for each one. We found an app called MileUp that rewards you for driving. You just download the app, let it run in the background and earn rewards points for each mile you drive. You can redeem your points for gift cards to major retailers, like Amazon and Target. The app’s goal is to improve accident-detection technology. It anonymously tracks how far and how often you drive and how many stops you make to get a clearer picture of traffic patterns. Don’t worry — you don’t have to use the app while you drive, so you’ll stay safe! Maybe you can’t tote passengers around in your old beater, but food doesn’t care how your car looks! Be at least 19 years old and have at least one year of driving experience. Have a driver’s license, insurance and vehicle registration. Be able to lift 30 pounds. Just like the rideshare option, you’ll set your own hours and only work when and how often you want to. That means how much you earn is largely up to you. If your car decides not to start one morning, no worries. You can also deliver food on your bicycle! You don’t need a fancy car to be a safe driver. We hope you are, regardless of your wheels! With an Allstate auto insurance policy, you can actually turn your conscientiousness into cash. Avoiding car accidents makes life better for everyone. Allstate offers drivers “safe driving bonus checks” — you’ll get two $50 checks for every year of accident-free driving. That’s $100 a year — and you’ll be safer. In addition to bonus checks, you’ll also be rewarded with a reduced deductible, saving you money any time you have to make a claim for your vehicle. You’ll get $100 off your deductible when you sign up, and an additional $100 off each year you continue driving safely, up to $500. If you’ve ever dreamed of traveling for work, but don’t want to commit to being away for days or weeks at a time, this could be the perfect compromise. A field work job might be just what you need. These jobs often allow you to work from home on your own schedule, but also require local or regional travel. So you can get that highway time you crave. Enjoy your solo time on the road, listening to podcasts, music and audiobooks — and get paid for it. Drive your beater around town, and help busy parents and professionals by delivering groceries through Instacart. Lots of people dread a trip to the grocery store so much they’re willing to pay someone to do it for them. They’ll put their shopping list into Instacart, and you make money being their personal shopper. You’ll work with Instacart to set your own hours, so you can work as much or little as you want. Between your commission and tips, you could earn up to $25 an hour — and do your own grocery shopping to boot! Through Amazon Flex, Prime members can order and receive items from Prime NOW within an hour. As it rolls out around the country, Amazon is hiring drivers to Flex in a variety of cities. As a Flex driver, you’ll work through the Amazon Flex app for Android to set your schedule ahead of time or pick up shifts when they’re available — whichever you prefer. You have to be at least 21 years old and provide your own transportation (but no one says it has to be pretty). Pay will vary by location, but Amazon says it’s between $18 and $25 an hour. Not bad for a side hustle!